We go inside the Humanities Division, the history of the Common Core, the Graduate Aid Initiative, and double majors to understand why the Humanities will always have a strong home at the University of Chicago. In the wake of the 2008 recession, the liberal arts, and the humanities in particular, have had to defend their existence. Collectively, states are spending 10.8 percent less on higher education than they were five years ago, a cut which prompted Governor Rick Scott (R-FL) to suggest that his state’s public universities charge students more for “non-strategic majors.” Articles crop up ad infinitum in publications like the Chronicle of Higher Education defending the value of the humanities—and debating how to save them. On one level, UChicago seems to have dodged existential questions of this kind. This spring quarter, philosophy professor Gabriel Lear taught a lecture titled “Aristotle on Virtue”. On the first day of class, students were fighting each other for seats. She had taught a similar course about five years ago, but back then, she only needed one TA. “Now I have to have two, and I still had to turn people away...I feel that I’m hearing more stories of students not being able to get into their first choices of classes.” In Spring 2012, 3.7 percent of all degrees in the College were awarded in philosophy, up from 2.5 percent a decade ago. Though perhaps this seems like modest increase, it takes on new significance in a year where Forbes Magazine ranks philosophy the fourth least lucrative major, with an unemployment rate of 10.8 percent for recent graduates. Philosophy isn’t the only humanities major with more students. English Department Chair Elaine Hadley attributed the increasing popularity of the English major, up 2.6 percentage points since 2002, in part to its inherent flexibility: “This department, in relation to other departments in our discipline, does value our self-understanding as an interdisciplinary place.” But Hadley views the growth in interdisciplinarity as potentially a double-edged sword: while the slew of double- and triple-majors over the last two decades has bolstered English major numbers, the same trend implicitly questions the value of an English degree on its own. Minors were first instituted at the University in 2003, the first wave all in humanities departments: Classics, Near Eastern Languages and Civilization, Romance Languages and Literatures, Slavic Languages, and Germanic Languages. Double- and triple-majors followed shortly after. “I heard colleagues from German saying, ‘Well, maybe not that many students want to major in German, but a number might just want to minor in German.’ So we instituted that as a way of trying to give students some transcript recognition,” said Dean of the College John Boyer (A.M. ’69, Ph.D. ’75), who initiated the changes during his third term as dean. Dean of the Division of the Humanities Martha Roth pointed to the downsizing of the Core in 1998 as one driving force behind this trend. “I’m not sure why they feel that’s important. I’ve counseled my own children not to do that, but people need to use this opportunity to explore and to try things you’re never going to have a chance to try again,” Roth added. Yet in spite of her resistance to this surge, Roth also noted that flexibility and collaboration across disciplines accounted both for the historic strength of their programs and their capacity to adapt to an ever-changing market. “Interdisciplinarity is in the DNA of this place,” Roth said, pointing specifically to the New Collegiate Division and majors like Interdisciplinary Studies in the Humanities (ISHum). Departments have been structured with flexibility in mind. The introduction of the Philosophy and Allied Fields track and the Creative Writing Program in English demonstrate efforts to better accommodate differences in student interest. Similarly, a burgeoning emphasis on “clusters” for undergraduates majoring in English places a premium on interdisciplinary learning. For a student interested in enslavement, for example, Hadley could encourage them to plan to “cluster” a history course on American slavery with a gender studies course focusing on prostitution. On the other hand, graduate humanities programs have faced more direct pressures from an adverse economic climate. Public universities and community colleges laid off humanities faculty in scores, and hiring has slowed to a halt—the number of available humanities faculty positions is still a third below its peak from 2007–8, according to The Chronicle of Higher Education. “It’s really rough out there,” said Professor Malynne Sternstein (A.B. ’87, A.M. ’90, Ph.D. ’96), who became an associate professor in the Slavic Language and Literature department in 2004. “Insofar as it seems as though the economy is bouncing back overall... I think that universities in general are a little bit behind the curve,” she said. In addition to the tight job market, the University’s Graduate Aid Initiative (GAI) has made graduate enrollment in the humanities both more affordable, but also more competitive. Announced in 2007 by President Robert Zimmer, the GAI pledged $50 million in funding to incoming doctoral students in the Humanities and Social Sciences for up to five years, covering tuition, health insurance, and a stipend. As part of the program, $2 million was allocated to providing health insurance to students who have matriculated since 2003 for the first five years in their programs. 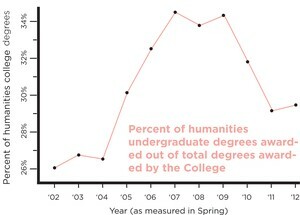 But since each student comes with a higher price tag for the Humanities division, fewer students are being admitted. “The Humanities division in general just doesn’t have the money to fund students because the beautiful part of getting into graduate school here is that you have a full ride,” Sternstein said. Before the GAI, graduate students were admitted with variable financial aid packages, with some paying tuition, others getting tuition waived, and many getting large stipends which were often inequitable. The implementation of the GAI varied on a departmental level, depending on what the viable program size was and where they had been funding students previously. “There’s a lot of them that were already funded at the right level, so it wasn’t an across-the-board cut,” she said. Some graduate students at the time of the GAI’s announcement felt that the package did not go far enough in providing support for current students, which culminated in a protest in 2008 during which over 150 students marched to the administration building to demand funding increases. But, many faculty members believe that the GAI has been integral in improving the overall health of their doctoral programs in the midst of a difficult economic climate. Hadley recalled that the decision to scale back the Ph.D. program felt like it was generated in part around concerns about the humanities job market. “Part of our responsibility is not to flood that market in excess of what it can manage,” said Hadley, who has been teaching at the University since 1994. Programmatic efforts in the English department to help graduate students in the job market have included a professionalization day and a pedagogy course. "Of course, you can find great minds and scholars at many universities, also lesser known ones, but not necessarily such a critical mass of young talent on the graduate level. This makes all the difference, and people actually seem engaged in each other’s work." This “critical mass” of the University—its large cohort of doctoral students—is one of the University’s most important demographics. Graduate students are largely responsible for organizing the University’s lauded workshops, of which there are currently over 60 in operation. Doctoral students are, with faculty, the standard by which Chicago’s reputation is weighed within academia. Ultimately, despite the apparent demographic shift, professors expressed confidence in an institutional safeguard that promises to preserve the humanities as a bastion of University culture: The Core. In 1942, Robert Maynard Hutchins, the University’s fifth president, adopted the all-Core four-year curriculum, from which the College has been gradually weaned. What distinguishes the Core is its emphasis on primary texts, which essentially place the humanities at the center of College culture. “The kind of conversations, the kind of culture of intellectual life in the student body, I would argue, compared to other schools, is infused with the humanities, is infused with humanistic ideas,” Boyer said. And there’s a practical connection that the Core requirement has with the University’s culture. In addition to bringing many undergraduates in contact with graduate students, who shoulder a good portion of the teaching load, “A lot of the teaching done in the Hum Core is done by the faculty, so I think this has been a way of always being able to protect the humanities...not just in terms of faculty lines and budgets but in terms of the mission of the place, which is actually quite important,” Boyer said. From Boyer’s perspective, the University, and, more specifically, the Core, continually shapes students to fit the prevailing ethos—not the other way around. Programs like Career Advancement, and the reduction of Core requirements, are intended to complement, rather than diminish, an education in the humanities. These programs give students the liberty to study the Humanities without sacrificing freedom of career choice. “The idea of the career programs is not to say that there’s anything wrong with the liberal arts or the humanities but rather to validate my belief that in fact these are excellent programs,” Boyer said.